One of the main attractions of Formentera are its paths, that facilitate access to the most beautiful parts of the island. 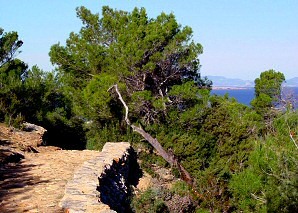 The most interesting is possibly the Camí de sa Pujada, also known as the Camí Romà. It is the final stretch of the ancient path of la Mola, that went from Sant Francesc Xavier to es Monestir. The Camí vell de la Mola can start at Sant Francesc, but the final stretch, that is the Camí de sa Pujada, begins at es Caló, following the signs. Sa Pujada, a route of only 1,500 metres with no difficulties, is covered approximately in an hour and offers panoramic views over the island, going round the spectacular cliffs of Racó de sa pujada and going through pine trees. On clear days the outline of Eivissa and the islets Vedrà and es Vedranell can also be seen. The path, restored and declared Property of Cultural Interest (BIC) with the category of a Monument, preserves remains of the ancient stone way, and also different points of interest, particularly the look out points, "les petjades del diable" (the devil's footprints), the old sand stone quarry and the cross engraved on the rocky floor.